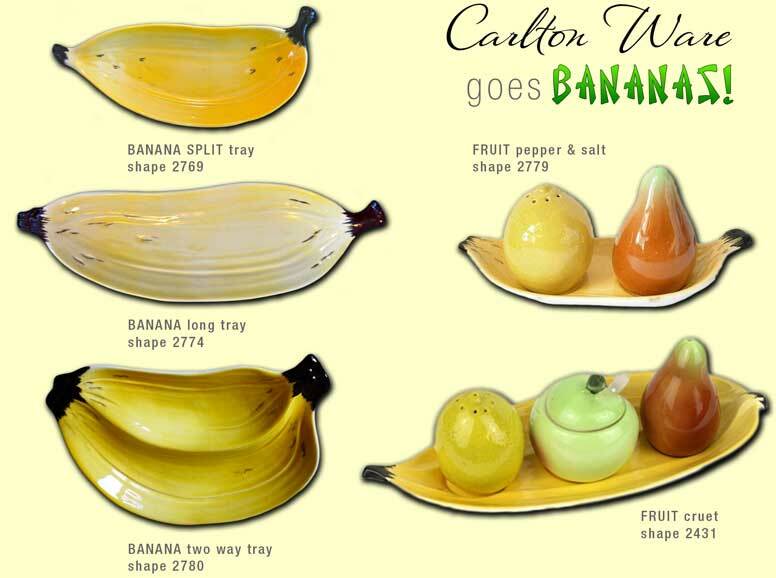 Carlton Ware World goes Bananas! As everyone knows, we have recently entered the Chinese Year of the Banana, this time marked by the moon as it changed phase to turn a bright yellow. The fruit is much revered in Chinese culture. 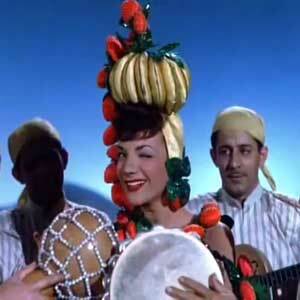 The banana was of course immortalized by Carmen Miranda in the 1943 Busby Berkeley Technicolor Musical, "The Gang's All Here" when she sang The Lady in the Tutti-Frutti Hat. 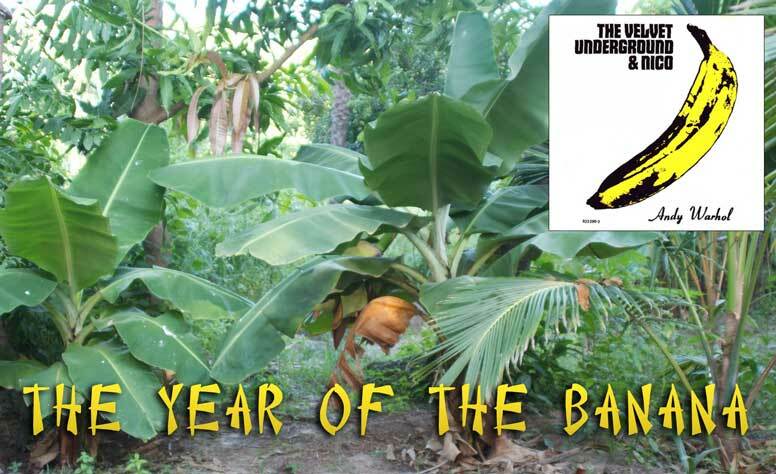 In 1967, Andy Warhol took the banana to an even higher level with the sleeve of the The Velvet Underground & Nico legendary debut record featuring the exotic fruit, shown in the inset above. Subsequently, there have been many tributes to Andy's banana. On a more accurate note, Carlton Ware was there first with its BANANA fruit bowl from 1930. It has as much humour as Miss Miranda and indeed Mr. Warhol. In 1958, some twenty years later, Carlton Ware employed the banana shape again, this time as the base for a FRUIT cruet, shape number S2431. Other forms followed- the BANANA SPLIT tray, S2769; BANANA long tray S2774; BANANA two-way tray S2780 and as the base for the FRUIT pepper & salt S2779. 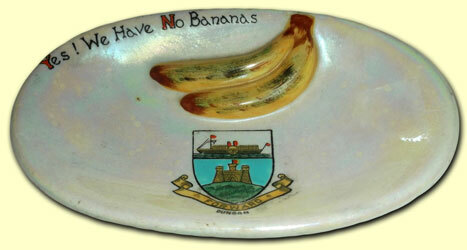 The banana was also used on Carlton Ware's Heraldic China recalling a popular comedy song Yes! We have no bananas from a 1922 Broadway musical. The title of the song has been resurrected many times since, including during World War Two, when it was used on UK's greengrocers' signs. 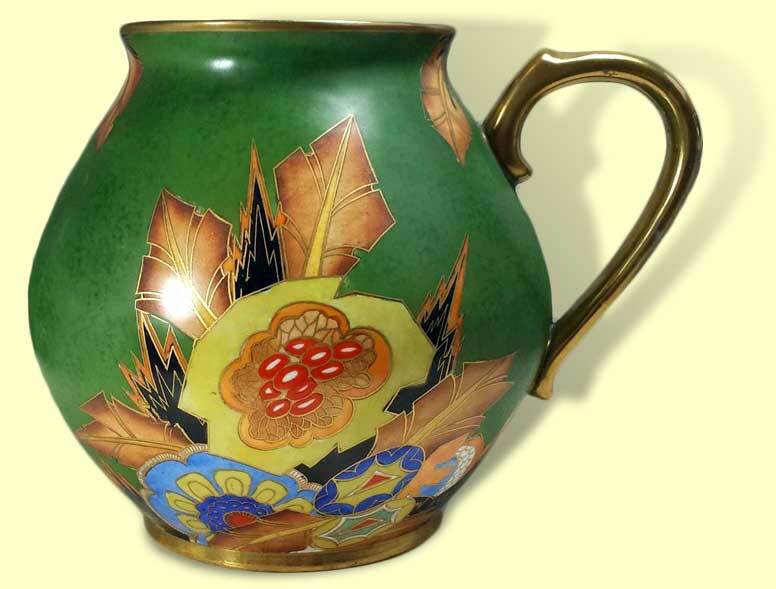 Moving from (the fun of) the ridiculous to the sublime, I wonder if it was the banana leaf that inspired the foliage in the exotic Jagged Bouquet, pattern number 3457, as on the jug vase below. For more fun, you might like to watch a clip from the Busby Berkeley movie from 1943 and watch bananas do the Mexican wave! Berkeley devised elaborate musical production numbers that often involved complex geometric patterns. He used large numbers of showgirls and props as fantasy elements in kaleidoscopic on-screen performances. Click on Miss Miranda's maracas to see her cha-cha-cha. Harvey Pettit © Copyright 2016. All rights reserved.